A week ago the Eurostat published the latest of the series of EU unemployment figures. There is good news and bad news. The level of unemployment level fell from December’s 9.9% to 9.8%. On a year-on-year comparison the overall unemployment rate decreased by 0.8% or 1.82 million people. That is certainly not an insignificant figure but at the same time it is hardly a reason for celebration. The situation in Europe remains critical especially in comparison to the United States where the level of unemployment is half of that in the EU (in February 2015 the US unemployment rate stood at 5.5%). The crisis has hit the young population hardest and in countries like Greece and Spain half of economically active under-25s are still out of work with few prospects to find any employment in the near future. Employment remains the issue for young people. The recent Erasmus generation survey shows that the majority of youth perceive job creation to be the most important priority for the EU in the next five years. Over the past few years youth joblessness has become firmly entrenched in our discourse. But to what extent do we actually understand the phenomenon and how we measure it? Statistics is a science of variation and to paraphrase Mark Twain, facts may be stubborn but statistics are pliable. What and how we measure matters. And it matters that much more in a group as specific as the young people. That is because many of those under 25 are still in education or training and yet when interpreting the reality we often ignore to take this specificity into account. First we can measure the unemployment rate. While perhaps most relied on by the media, it is not the most relevant statistic there is. 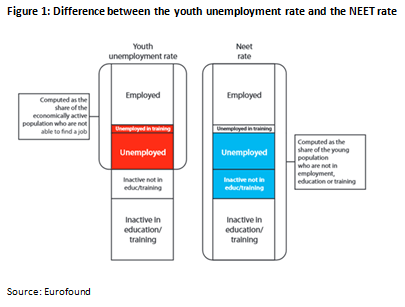 Unemployment rate calculates the proportion of unemployed / unemployed in training seeking work out of the group of economically active young people. To some extent, young people are economically inactive by definition as many of them study until their mid-20s without holding a job. Furthermore, unemployment rates exclude all those who are no longer in education but are not economically active because they are not seeking work. The picture is therefore significantly distorted. Alternatively, and to look at the entire youth population we can measure the so called NEETs levels – that is the levels of those Not in Education, Employment or Training. This approach allows us to get a more accurate picture of those who should be the focus of governments’ attention – i.e. those economically active and unemployed as well as those who have long given up on seeking work and are no longer in education or training. 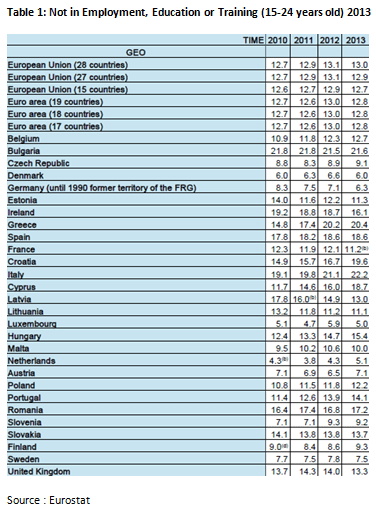 The latest figures from Eurostat show that the NEET rate for the EU28 in 2013 stood at 13% (see Figure 1 below). In countries like Greece and Spain the level reached 20.4% and 18.6% respectively. The reason why NEET levels are lower (but still too high to ignore) than unemployment rates is explained by the more inclusive nature of the former. NEET rates are calculated as a proportion of those not in employment, education or training from the entire youth population which makes the denominator bigger and proportion smaller. This also means that NEET rate offers a more inclusive and relevant picture of the situation of youth economic disengagement. The most important advantage of using these figures – as opposed to youth unemployment rates – rests in their ability to tell the more accurate story which, if used, could lead to better policy-making. At the moment, many EU Member States’ welfare and educational systems are not geared towards addressing the youth unemployment. This is particularly true when it comes to those who are furthest away from the labour market – the NEETs. In its bit to help alleviate youth unemployment the Juncker Commission has proposed the so called Youth Guarantee scheme. The aim of the programme is to ensure that ‘all young people under 25 – whether registered with employment services or not – get a good-quality, concrete offer within 4 months of them leaving formal education or becoming unemployed’. What this means for Member States is not only more money from the EU budget but more importantly structural reforms of their social security and education systems in order to reach out to those currently falling through the cracks. The EU will therefore pressure countries into better integration of the countries’ Public Employment Systems with social services, schools and universities as well as NGOs. The focus must be placed on better school-to-work transition by offering meaningful apprenticeship and training programmes. To underpin these structural reforms, the EU’s Executive has proposed, as part of the European Semester a number of concrete and country-specific recommendations. On top of the EU funded and co-funded programmes, including the Youth Employment Initiative, the Member States should further allocate their own resources to better tackle youth economic disengagement. Within the limits of the fiscal straightjacket of the Growth and Stability Pact, countries should prioritise ‘growth-friendly’ fiscal consolidation which should reinforce the functioning of employment services and active labour market policies. However, even by the European Commission’s own admission, none of the measures above will be enough to deal with youth unemployment in a slow- or no-growth economy. It needs to be said from the outset that many Member States have been discouraged to pursue desirable counter-cyclical fiscal policies due to their high indebtedness. But the lack of fiscal maneuver cannot be an excuse for doing nothing. In absence of a fiscal stimulus, countries both at the national and European level can pursue a number of policies. The aim of such efforts should lead to building a knowledge-based, smart and sustainable economy. This spills over into a few areas from green policies to flexible labour market. First of all, the European Union and its Member States should work on creating a real digital single market and improve the insufficiently developed single market in services in order to facilitate economic activity. Second of all, investment – where possible and both at the national and EU level – should be made into green technologies and infrastructure projects. Furthermore and in addition to measures concerning young people already described above, countries should focus their efforts on enhancing and developing pro-active labour policies. Europe desperately needs better labour mobility both within and between countries. According to the Eurostat figures, there are 2 million unfulfilled vacancies currently in the EU. Policy-makers need to ensure that the education systems generate skilled and employable people while at the same time internal migration within the EU should be encouraged, not demonized. And it is the power discourse that should concern us too. A number of anti-immigration movements and political parties have recently gained ground in Europe. They have been fed by wildly believed, popular but untrue myths and just like in the case of immigration youth unemployment has had its share of half-truths. The best known, the phenomenon of ‘lost generation’, demonstrates to what extent the existence of youth unemployment has become a norm. So much so that we have, subconsciously at least, given up on those who have allegedly given up on themselves. But while it may be easier to ignore the inconvenient truth, doing so comes with a price tag that needs to be footed by us all. According to Eurofound, in 2008 alone the EU member states paid almost €120 billion on measures related to ‘labour market disengagement of young people’. The sum accounts to about 1% of the EU’s GDP output. Since then the bill grew to €153 billion in 2011 and some countries, notably Bulgaria, Cyprus, Greece, Hungary, Ireland, Italy, Latvia and Poland have had to allocate as much as 2% of their GDP on consequences caused by high levels of NEETs. However, the economic cost expressed in euros is only half of the equation. Disenchanted and disengaged young people who feel they have no stake in the society are bound to have an effect on more than our budgets. The desperation of joblessness has a direct impact on them personally – in that it knocks down their self-worth, aspirations and hopes – but also an indirect impact on us all, notably in terms of the quality of our democracy. 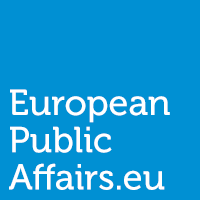 In a 170-page study Eurofound argues that ‘the level of institutional trust among NEETs is considerably lower than the rest of the young population’. This is particularly true among those who are unemployed but searching for jobs. Similar conclusions can be drawn from the case of ‘interpersonal trust’ and NEETs also show a significantly lower interest in politics compared to non-NEETs. Furthermore, in general, young non-NEETs have a much higher social participation rate than NEETs (46% and 26.7% respectively). However, more recently we have witnessed a somewhat contradictory development in this regard. In countries such as Greece and Spain young people have turned their frustrations into voting for unconventional and some would say extreme parties. This has already translated into electoral victory of Greece’s Syriza and Spain’s Podemos is set to re-shape the country’s political landscape in the upcoming December elections. It therefore seems that the current crisis has morphed itself into two outcomes: either young people do not vote at all or they vote for the unconventional parties. In simple terms, economic disengagement leads to a desperation and apathy which is born not only by individuals directly impacted but by the entire communities as the budgetary spending grows and quality of democracy falls. Youth economic disengagement has reached a scale whereby we can no longer pretend it does not concern us all. Youth unemployment is a collective problem and it needs to be tackled and dealt with for the sake of NEETs as well as the rest of us. Decisions must be made using the most accurate and inclusive figures. To this end and in order to better tailor-make our policies the emphasis on youth unemployment rate should be replaced by NEET rates. However, one is often confronted with the argument that even if we knew how to better target our spending priorities, there just simply is not any money left to spend. EU Member States will continue to be constrained by fiscal rules and therefore ambitions must be checked against reality. While there are many measures that would not necessarily mean more spending, the argument that policies may be too costly to implement needs to be challenged. Not least because we have reached the point when doing nothing costs us more than doing something. Spending money on symptoms rather than causes costs countries up to 2% of their GDP output. Furthermore, other less quantifiable costs have been in the meantime drowned out from our public space. The non-existent or desperate political engagement of young people, their loss of self-worth and hope for the future are just as every bit relevant as the crude and faceless GDP figures. Let us not forget that investing in young people makes not only an economic sense but that it a ticket to a more robust, balanced, fairer and satisfied society. Hey, great article! When thinking about the NEET rate, however, wouldn’t it be the most accurate to broaden it again a little bit to include those young people who are currently in training because they do not find work? There are a number of member states offering this approach, but we do not know if it works out in the end: Young people may have participated in many additional training classes but still be unable to find a job – because, simply put, if there are no jobs, there are no jobs. Some member states may be tempted to massage their youth unemployment statistics by stating, “Hey, we just have a lot of young people in training!” – whereas these trainings might lead nowhere. What’s your stance on this (and I am aware that it might be difficult to measure the percentage of young people being in training “unvoluntarily” – not every member state collects these data)? Thank you for your comment. You’re right – perhaps there should be a sub-group within the category of ‘unemployed in training’ because as it happens there are plenty of examples when the authorities keep ‘training’ an individual for as long as he/she doesn’t get a job – which may be never. In that case, after one cycle of training or two, individuals could be classed as NEETs. The bottom line is, however, that as you say if there are no jobs there are no jobs and that is why we need growth in the EU to ensure that our improved and reformed social and education systems can match individuals with jobs rather than with an illusion of a job.